Late last summer I was able to be on the road for a few days. While there’s nothing left of railroading in the Okanagan there are main line rails just 2 or three hours out. One place captured my interest right away. 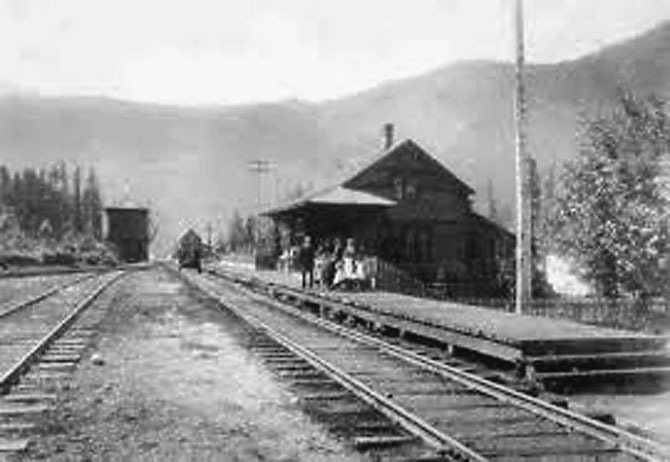 There were plenty of trains, about 30 a day, amazing scenery, easy access – with good accommodation right at hand and best of all, a ghost town. That other passion of mine. Now toss in a wonderful hot springs with drinks at poolside. I just couldn’t have made this up. At the turn of the last century Albert Canyon was home for CPR’s pusher engines needed to get eastbound trains up through Glacier and to the top of Rogers Pass. The small community had a station, servicing facilities, a Y and an engine house. The water tank and one leg of the Y can be seen at the far left. Revelstoke is west, over the hill, in the distance. Permanent residence enjoyed an active primary school until at least 1960.